Whether your wicker furniture is in your formal living room or serving a more casual purpose on your porch or sunroom, it's an investment you want to take care of. 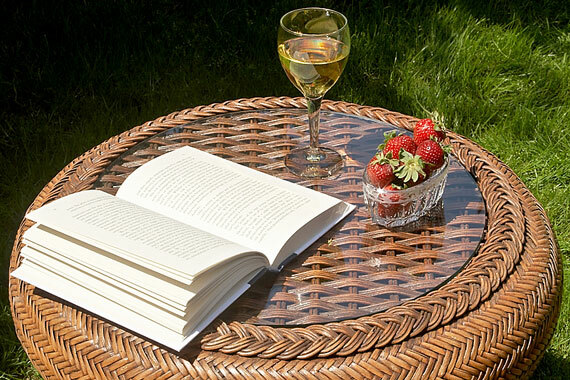 With a little know-how and elbow grease, you can ensure that your wicker furniture lasts for a long time. You should clean your wicker several times a year. A good time to clean your wicker furniture is at the change of seasons. If you are taking wicker furniture out of storage for seasonal use, clean it before you put it out, as well as right before you store it. The best way to clean wicker is with a stiff brush and warm, soapy water. For hard-to-reach areas, try a toothbrush. An air compressor — one normally used to blow up air mattresses and vinyl toys — can also dislodge dust, grime, and dirt that can't be reached through conventional methods. In addition, wicker made from rattan reeds or willow — whether it is painted or not — should be wiped down with a damp cloth about once every two weeks. This will ensure that the furniture is not only clean, but stays supple and flexible. If you notice that your reed or willow furniture is becoming dry or brittle, hose it off. The water will restore moisture, and thus flexibility, to the reeds. Wicker made of seagrass or fiber should not be hosed off, as it will ruin the integrity of the reeds and weaken them. For cleaning this type of wicker furniture, use only a damp cloth. Always know exactly what material your wicker furniture is made out of before you clean it! If you aren't sure what your furniture is made of and it requires immediate cleaning, use a damp cloth to be on the safe side. Later, you can research how your furniture was made and clean it accordingly. If you have natural reed or willow wicker that has stubborn dirt and grime which isn't responding to repeated cleanings with soap and water, you may use a very diluted formula of household bleach. This will whiten natural wicker. However, it is a good idea to test the solution before using it on visible areas of your furniture. Try using it on a part of the wicker, such as the underside, that isn't visible. Proceed cautiously, and err on the side of caution by using too little bleach rather than too much. With the proper care, you can enjoy your wicker furniture for years to come. For more information about wicker furniture maintenance, see this wicker furniture care and cleaning article.